The Crystal Council Box is a monthly healing crystal subscription box completely customized for you. You'll receive a survey each month and we'll customize your box based off of what you indicated you would like to achieve. It can anything from love & relationships, to anxiety relief & inner peace. Our box felt so personal - it was like getting a package feom a friend and cheerleader rather than some stranger at a subscription box service :). Thank you! I absolutely adore my box because it's helping me in ways that I couldn't imagine. And has given me wisdom on the stones that I didn't even know could happen upon these stones. I am grateful for them all!! I love my box because it gives me something to look forward to each month. Each crystal Inside has such a powerful and strong meaning. The sage leaves have such a relaxing scent and feeling. Thank you so much for taking your time to make these boxes for me. I love my boxes so much. I look forward to them every month! The last box had some Kyanite in it and it was a wonderful surprise. So exciting to get and so much thought put into every box! I love my box because of the beautiful intuitively selected treasures that appear each month. I learn something new or revisit old friends. I always look forward to each box! I love the personal messages. They tell you what crystals you received and how to use them. it is tailored to me and each box is unique! i feel so special and excited when i receive it in the mail! it’s my favorite every month to look forward to! I love my box because of how completely personalized it is! I’m always pleasantly surprised by the uniqueness of my boxes. Beautiful quality as well. I love each box and the descriptions of the crystals. I appreciate how the boxes reflect my surveys so well and offer me tools. I love my box because it seems so personal. It is a perfect selection every time. I love my box because the crystals were just what I needed! They are also really pretty. Make the choice between our Master or Apprentice box and start your subscription. Both boxes are packed full of crystals, trinkets, meditation tools, soaps, oils and more. The first of each month you’ll receive a link (via text or email) with a short survey. This survey will let us know which aspects of your life you wish to improve. It can be anything from changing your daily attitude to manifesting your life goals. Based on your response, we will craft a personalized box with unique crystals and items that will help you along your journey that month. The Crystal Council is here to assist you along the way. It is our pleasure to help you grow. What happens if I don't fill out my survey? No survey? No problem. If you don't fill out your survey in time we will send you over our regular box of the month full of items. Can I give the Crystal Council Box as a gift? Your card will be charged the 20th of each billing cycle period (1 Month, 3 Months, 6 Months). 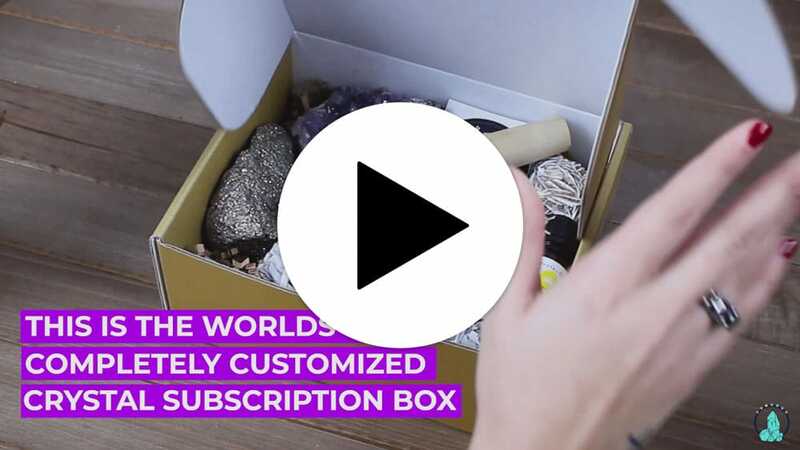 If you purchase your subscription box per month, you will automatically be charged each month. If you purchase your subscription box in 3 or 6 month intervals, you will have the option to have it automatically renew upon expiration. How long will I have to fill out each survey? You will have from the 1st to the 10th of each month. We'll send you a reminder email if you haven't filled your survey out on the 10th. If you don't fill your survey out by the 10th we'll send you the regular box of the month. How can the crystals help me? What you put into each crystal is what you get out, they all have their own unique properties and are eagerly waiting to aid you. Each crystal is programmable in its own way, meaning that each crystal can serve you based on your intention combined with its purpose. For example, Rose Quartz is associated with love and relationships. You can use this crystal in your daily life to bring about more of and amplify these aspects of your life.